Things are calming down in terms of ground preparation, sowing and planting. 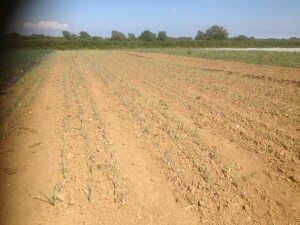 the majority of this years crops are in the ground & putting down roots in search of moisture! Its been an unusual season….again….Winter stretched into mid May. This left us unable to prepare the ground for planting until late May. 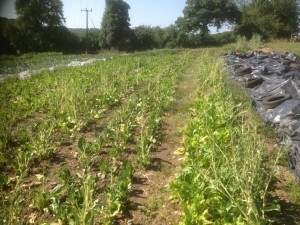 It also meant that the early crops such as the first salads, that we did manage to get in didn’t do so well, as they thought it was still January. Pace of work wise, personally I feel like I go from walking pace in February to a gentle jog in March. This turns into a run in early April & becomes a sprint by late April. I’m then running full pelt throughout May & June until the start of July. This year, that run was done in the full heat. I feel like I don’t really get a chance to look at the crops. If I’m not at the field or working with a school group, I’m lying down in the shade or getting in the sea to cool off. So it was a pleasant surprise to walk around this weekend and see how everything is establishing. The courgettes are starting to deliver their goods. Surprisingly, considering again the lack of rain. 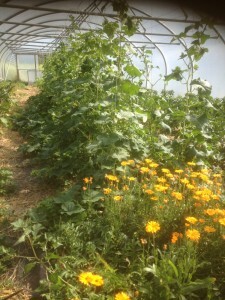 Alongside them we have a bumper crop of winter squash which are also now settling in. 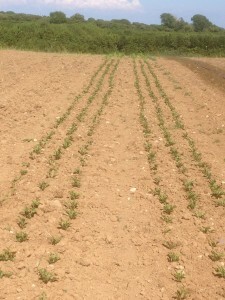 They have a rough start, being hit by strong winds for three days following planting & then no rain. Again, assuming we get some moisture this summer we are growing squash for our membership & enough squash to feed 2500 people at an arts event in September with squash soup. 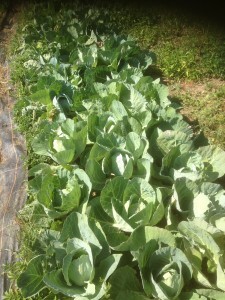 The brassicas are happy under their cover. It seems to have done a good job of keeping in the moisture too. The brassicas are quick to get their roots down so establish easily. Another bonus of the dry weather is the lack of weed seed germination. 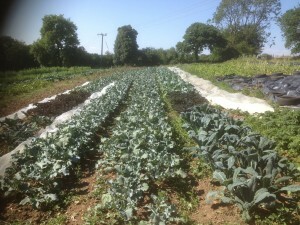 We haven’t yet had to weed the brassicas & they’re now covering the surface completely. We’ve gotten right on top of salad sowing now. 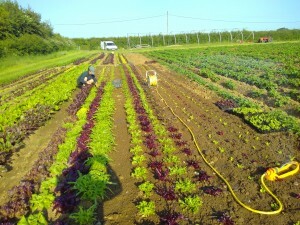 Having filled most spaces at Webbsfield, we’re filling in gaps at Furzehill with a plentiful salad supply. They seem really delicate getting planted into the open dry ground here and sometimes need 2 waterings, but they’re doing great. And not a ******* slug for a mile! Our 9000 leeks have given me a bit of stress. 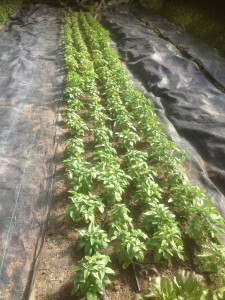 This year we started them in the tunnel in a seed bed which worked perfectly. I was hoping for some overcast or damp weather to transplant them, but realising it wasn’t going to happen, we moved them to Furzehill before the heat got to them in the tunnel. They looked pretty bedraggled for the first 2 weeks, having been topped & tailed & planted into a desert. We’ve watered them every week which takes about half a day & now they seem pretty pert & lively. So as they mature, hopefully they won’t be too scarred by their early experiences. The onions have been pretty hassle free. Both the sets & the seeded modules have established well. Just took one monotonous hand weed as due to our attention falling elsewhere we didn’t get to weed these until the last minute. We should have our most plentiful onion supply yet. The roots have been a real stress……but having got through this weekend I’ve seen the light at the end of the tunnel & they’re finally all germinating. Thanks largely to this new bit of kit, an irrigation pipe which waters our 80m bed with a fine mist keeping the surface damp, but needing moving every couple of hours. The parsnips I got in a bit earlier, so they benefitted from a downpour the day after sowing & have germinated fairly well. 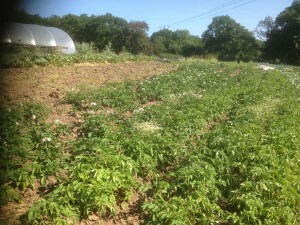 The carrots went in a bit later & have sat doing nothing for close to a month in the unrelenting heat. But with consistent pipe moving 7 days a week we’ve gotten there! At the far end we are still planting beetroot & sweetcorn. These are doing well. 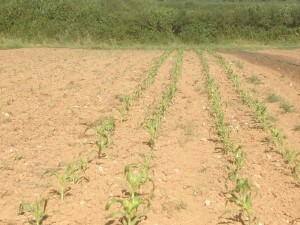 The sweetcorn is happy enough, although I know as everything else it is in need of a downpour. 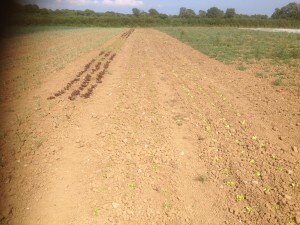 We’ve also planted a whole load of fennel, celery & celeriac at the other field, but next year they will slot in this end of the rotation at Furzehill. Francesca is also at Furzehill & her salads are booming with a plentiful water supply, a consistent & attentive gardeners shadow. 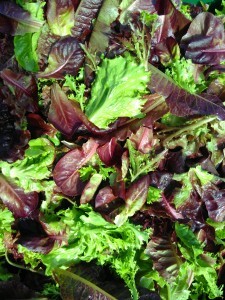 (Check out the recent blog on Francesca’s salads). And whats happening at Webbsfield…. Seedlings for both the fields are started here. 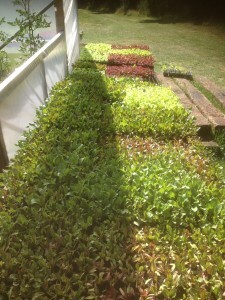 Its been great weather for consistent germination & quick growth in trays. The hassle has been getting here to water twice a day at weekends. I love to come early & water but dragging yourself away from the beach on a Sunday evening its less inviting. There’s generally long periods where we don’t have to water seedlings once they’re out doors, but this season has been non stop. I have to give a massive thankyou to Peter & Marjon who came to camp & volunteer with us from London. They took over watering duties for most of 10 days which was a real pleasure not to have to think about it. They also got plenty of beach time in too. The tomatoes are booming. They were sown earlier this year & we’ve had not stop sun & good irrigation, but they’re still waiting until this week to be ripe. We are expecting a bumper crop. 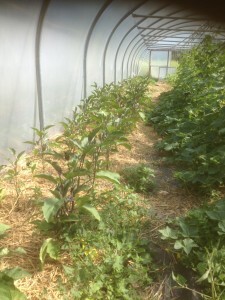 We’ve been keeping the tunnels fully ventilated as we noticed some of the cucumbers tasting bitter. We assume its heat stress. 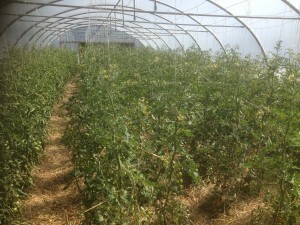 We definitely feel heat stress when we’re side shooting tomatoes in there. Aubergines are establishing well and starting to form fruit. We staggered the cucumber sowing as we had an attack of aphids early on so re-sowed half the crop. We’re already taking about 150 cucumbers a week from half the crop, so be prepared for an onslaught of cucumbers! Hopefully not bitter ones. The sweet peppers are also starting to fruit. We’ve had an issue with waterlogging where run off from irrigation soaks the bottom corner of this tunnel. 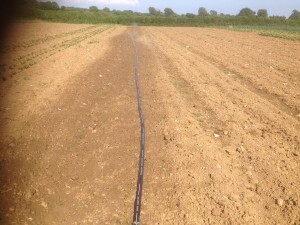 We have replanted & then disconnected the irrigation at the lower end of each row so that these crops will only be watered by run off from other crops. We’ll see how they settle in. 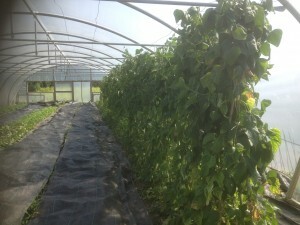 Runner beans coming nicely in the partial shade between 2 tunnels. The french beans are usually much happier in the tunnel, but this year not. They aren’t producing much. Just too bloody hot for them in there. 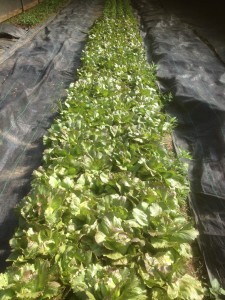 A salad seed crop we’re growing for real seeds. Looks lusciously healthy. Basil is loving this tunnel heat. 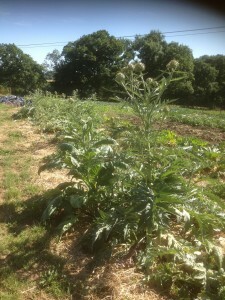 Globe artichoke numbers massively down on last year. As are rhubarb & strawberries. I’m assuming they missing the moisture. 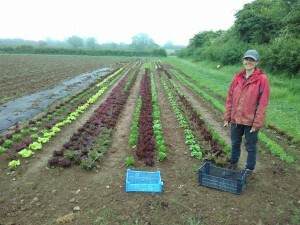 We’ve had 5 weeks pickings from the chard but its feeling the heat & starting to bolt. Its done us well. Summer brassica patch of broccoli, kale, cabbage doing ok. Summer cauli decided it was too dry & have not moved since planting. Dwarf french beans took a bit of re-sowing due to early slug losses, but they’re coming & should do well if they can mine enough moisture from Webbsfield. The first sowings of pea & mangetout have done really well, but the successional sowings have failed due to lack of moisture & pigeons. 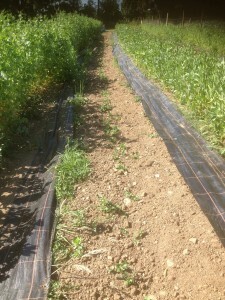 Next year we will pre soak peas & cover the bed whilst they germinate to hold moisture & keep out the birds. We had some good early harvests of broad beans too. These were from both the over wintered outdoors & the early tunnel crops. The next lot are about to bean up, so more expect them in the coming week or 2. 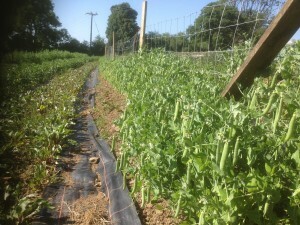 We usually start to loose our broad bean crop to black spot by July due to rain, but not this year….at least so far. This means we may still get the last sowing flowering & producing in August. Early spuds at Webbsfield have been pretty rubbish. 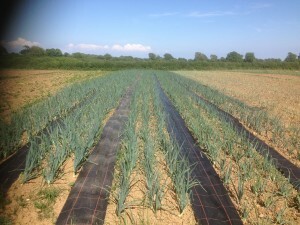 Planted late as it was so cold & wet, then as they established it totally dried out. 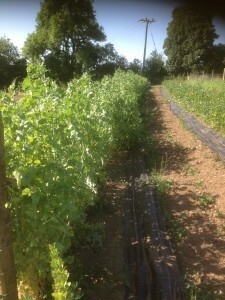 The maincrop planted a few weeks later at Furzehill have done better. I assume this is due to the ploughed in turf holding mositure. So overall it looks to be a plentiful season, assuming we get some rain between now & September. If we don’t, then I expect that crop bulk will be down, but hopefully not drastically. A massive thanks to Lizzy, Abbi & Isabel who have worked through the unrelenting heat to get all this stuff sown, planted, weeded, harvested…Also a massive thanks to all our volunteers. We couldn’t do this without you. The pictures are in reverse order…..
A massive thankyou to Neil Barry at Swansea Community Green Spaces Project. 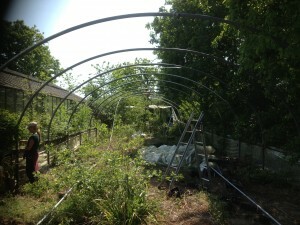 Also to Dai who donated a tunnel frame to us from the site next door to the Wildflower Cafe. 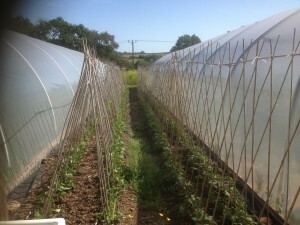 A series of fortunate co-incidences led to us getting a tunnel in place at Furzehill for Francesca to set up this autumn with her salads & greens. 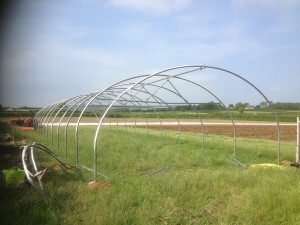 A couple of months ago one of our volunteers said a friend of hers (Dai) was in the process of selling land at the wildflower cafe near Swansea airport and would possibly let us have a polytunnel frame that needed moving. She rang Dai who happened to be passing & called in 10 minutes later. The tunnel frame was ours when we had time to take it down! 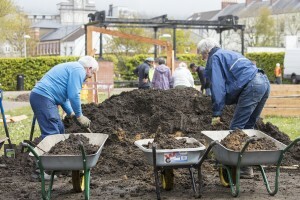 A few weeks later we had an email from Neil Barry of Swansea Community Green Spaces Project. 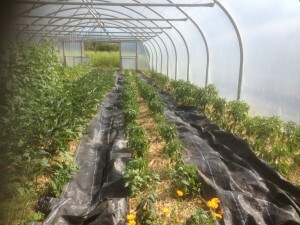 They had £2000 that was set aside for a project to install a polytunnel on another project which had not gone ahead. The funds were from Big Lottery & their preference was to use the money to support a local project rather than return it. The catch was that we had about 10 days to do this! So between myself, Abbi, Francesca, Oli & Bob, we managed to get the old frame down & re-erect it in record time…..
We need now to complete the carpentry & the tunnel can be re-covered some time this summer. Although the tunnel was free it costs us £1500 to get a number of bits of frame that were missing, plus all the carpentry, postcrete etc plus £500 to employ labour to help us. But new this tunnel would cost approx £5000 and thats without the cost of putting it up! Thankyou to everyone who helped to take it down & put it up. Big thanks to Big Lottery, Dai & Neil!! A few pictures of GRAFT in development. 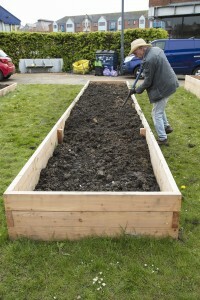 (The project we are involved with in the heart of Swansea)…..The beds are full up, the pergola is up, planting has started with schools & adult volunteers. Drop in & have a look if you’re near the Maritime Museum. Based at the Maritime Museum in the heart of Swansea. 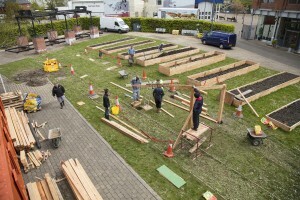 This is a community garden, arts & educational project led by artist Owen Griffiths in partnership with The National Waterfront Museum, NTH/NYA & Cae Tan CSA. The basic idea is to develop an educational & social resource which can inspire visiting groups & volunteers to grow their own food. Currently we are working with a local primary school and a number of community groups. The raised beds have just been completed. Tom & Geoff have designed a cropping plan which Geoff has sketched out above. 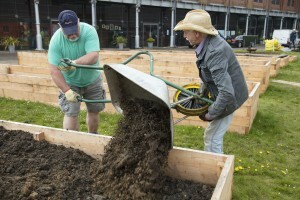 This will incorporate a range of edible herbs, flowers & vegetables. 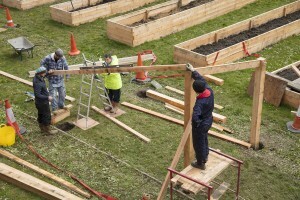 A pergola is being erected on which we will be growing squash, beans & flowers. The garden is part of a wider called ‘Now The Hero’. This will culminate in September with a celebration in Swansea. At the event 500 people per night will be fed for 5 consecutive nights with squash and other produce grown at Cae Tan & Graft. We hope that in the long term, this can become a training base for Cae Tan working with town based schools & community groups. Furzehill kicks into full action! Following one of the latest wettest, coldest springs anyone can remember we finally got onto the fields at Furzehill. 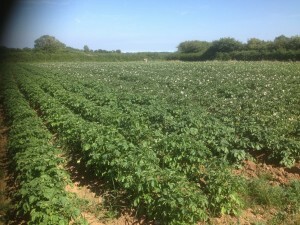 Cae Tan’s main plot was ploughed by a contractor & then we have done further cultivation. Myself & Francesca spent an hour one evening digging to find the water pipe unsuccessfully. We came back the following morning with extra troops (Lizzy, Abbi & Isabel) to dig over the area we were told we’d find the pipe. A few local farmers saw myself & 4 young women digging by the gate & all stopped to find out what was going on & offer their opinions. One of these was Cyril. He was my neighbour as a kid, a local farmer & Welsh cob breeder. Like most local farmers he always thought I was a bit of a weirdo being into that organic lark. However, seeing me leaning on the gate whilst 4 young women dug out a water pipe I think he may have been converted to organic! In his eyes I’d say he definitely thinks I have totally arrived! 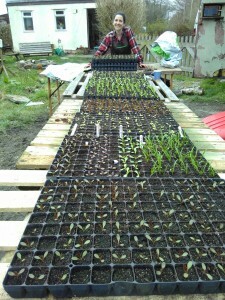 Francesca & her dad got stuck into bed preparation & have got lots of salads planted out, onions are going in today, hopefully spuds tomorrow….better late than never. A few weeks back we hosted an event in partnership with Swansea Food Assembly & The Square Peg Cafe. This involved showing the film ‘In Our Hands’ made by the Landworkers Alliance. Square Peg provided delicious food using our veg & Gower Meadow Beef. The evening was a great success, good fun & inspired lots of discussion. On the back of this we decided to invite organic farmer & activist Gerald Miles to come & give a talk. Then when our new trainee Abbi said that her & her partner Rhys wanted to cook a veggie feast for our members we decided to combine the two. So last Friday forty people came & feasted on an amazing three course sit down dinner. 70% were members & as the event was open to non members also. The dinner was followed by an inspiring & entertaining talk from Gerald sketching out his journey from conventional Pembrokeshire farmer, to organic farmer, to CSA pioneer & international GM activist!! We will be hosting more Food For Thought events throughout the year. Keep an eye on our facebook account. It’s that time of year when people are drawn out into the field again to see whats going on. Jess & Helen ran a family session today & had 11 adults, 11 kids. They built pathways, weeded doc’s, played games, socialised…..
Every Thursday we have volunteers, both members & non members who come to harvest, sow, weed, chat, drink tea….. Various youth groups, colleges, garden groups & schools come here for training or for a visit. For 7 months of the year we have 2 trainees who get involved in all aspects of our work, learning the ropes, getting to know the regular volunteers, getting to know the lie of the land & plotting their way forwards following their time here. Myself & Lizzie have the pleasure to meet, work & talk with so many different people who pass through. Some become regulars, some vanish to who knows where, but they all take something of the land here with them & they all leave an impression which shapes how we work. In the 4 years we have been growing, its possible that more people have set foot on this field than have done in the last few hundred years. 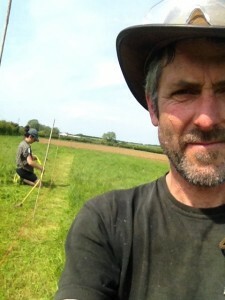 Thankyou to all our volunteers, visitors, trainees, kids…..Long may you all come & go, enjoy the field & build a connection to this lovely place. Three members of Cae Tan were lucky to attend a Commercial Seed Saving Training with the Real Seed Catalogue this week at their HQ in Pembrokeshire. 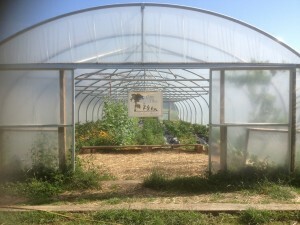 Funded & organised by the Gaia Foundation Seed Sovereignty UK programme. 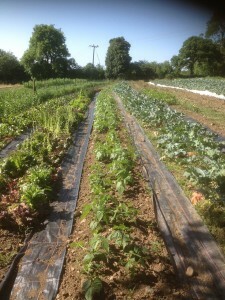 Their mission is to boost small scale sustainable UK seed growers numbers & skills. During the day we learned about the practicalities & economics of saving seed for commercial sale. Cae Tan will now endeavour to grow a range of seed for ourselves this season, plus a couple of varieties for the Real Seed catalogue. We will use this season to improve our skills with ongoing support from the newly formed Wales Seed Co-op, Gaia Foundation & Real Seeds. We will be exploring potential markets, including the possibility of gaining biodynamic certification, so that we could sell to the Seed Co-op UK. We also hope to get Kate from Real Seeds down at some point this year to talk about seed saving, as we are aware this is a subject many people are interested in. We ran two training days this & last week with West Wales Willows. 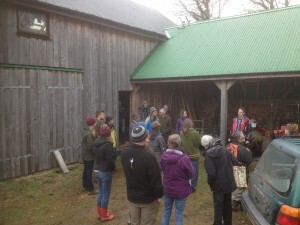 During these workshops we explored building fertility on the land through growing green manure crops & short rotation willow coppice. The basic idea is to work towards becoming self sufficient in growing the fertility that feeds our soils & thereby our crops & eventually us! 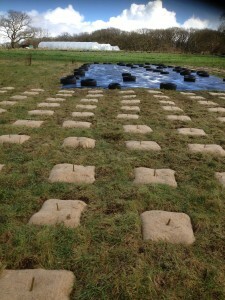 We also have some really wet ground that we wanted to make use of. Currently we rely on a mixture of some green manure crops, plus whatever manures & composts we can bring in from locals farms. There is always a risk not knowing what weeds or possibly even chemicals come into our soils with this imported material. 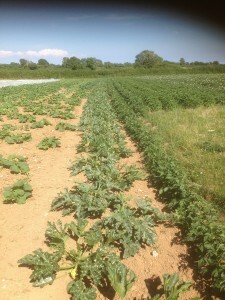 This will be chipped after harvest & the chips applied to the areas of green manures. 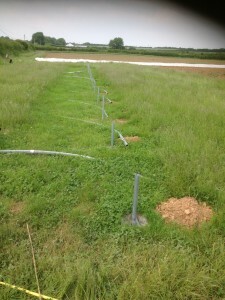 They will be building soil carbon & increasing soil biological activity. 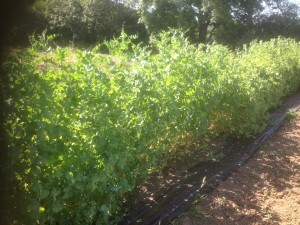 We currently grow a range of green manure crops, but given the new land at Furzehill, we now have the ability to open out our rotation & account for growing our own fertility too. We have planted 400 willow cuttings this week through plastic, biodegradable mats & a small section just mulched with woodchip. 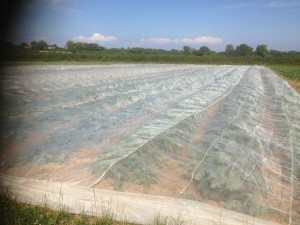 West Wales Willow generally use plastic sheeting. This can be removed after the willow is established & recycled. However, it is plastic, it reduces biodiversity around the coppice area & looks ugly whilst its there. So we decided to try half of the planting through biodegradable mulch mat. We’ll see how the willow compare in the coming years. We will cut the willow back next year & select a few main stems from each cutting. (Next years cuttings will be planted to double our willow area. We’ll d this every year til we have about an acre). We will then strip the majority of buds so that its energy goes into producing long poles. After 3 to 5 years we will cut & chip these long poles. 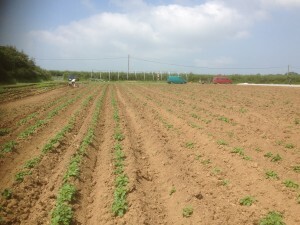 The chip will go onto the green manure crops. We are exploring if this will first be composted or not. The cycle starts again. 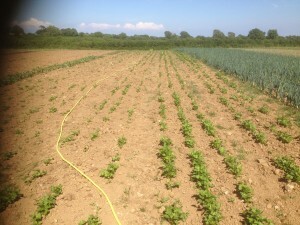 This way we cut & chip a different area every 3 to 5 years, returning to our original plot once that has re grown. After 30 years the willow will be pretty tired, so it may be replaced with new willows or become habitat.